As to be expected from being one of the most visited villages in the Cotswolds, Broadway has an excellent variety of Bed and Breakfasts (B&Bs') and Guest Houses. You are able to choose from charming period Cotswold stone establishments to the 'relatively' modern Victorian and Edwardian houses on the fringe of the village only 3 to 4 minutes walk from the village centre. Broadway village, in the main, consists of one long High Street: the lower part with an excellent assortment of shops, restaurants, two hotels and a shopping arcade. The upper part of the High Street boasts some of the most beautiful period stone cottages and houses to be found anywhere in the Cotswolds. 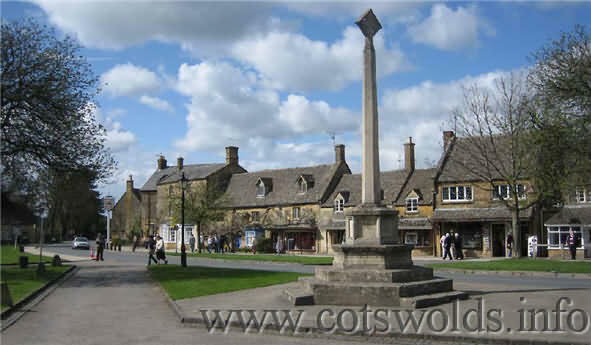 The village of Broadway, being in the northern Cotswolds, is constructed of the stunning golden honey coloured limestone natural to the area, the colours and hues of which subtly change depending on the time of year and angle of sunlight. You will find Bed and Breakfasts in Broadway are all invariably of high standard with each having its own distinct character and combined with the owners individual flair ensures you have plenty of choice for your particular accommodation preference. peace and tranquility with glorious, unrestricted views out over the Cotswold hills. with its delightful array of independent boutique shops, restaurants and inns. Hadley House is a classic Cotswold stone house, built around the turn of the last century situated in the heart of the beautiful village of Broadway. It has been sympathetically and tastefully modernised in 2007 to provide comfortable and contemporary accommodation, yet still retains its original character. We are positioned right in the heart of Broadway village, only 100 yards from one of the most famous and truly beautiful High Streets in the whole of the Cotswolds. Breakfast is served in our beautifully designed dining room with adjoining conservatory and patio area overlooking the rear garden. Free parking is available at the side of the house . Well behaved dogs by prior arrangement £10 per night. We have two double rooms and one ground floor twin suite. All of our rooms have brand new en-suites and are comfortably furnished with every convenience including: flat panel LCD TV's, tea/coffee making facilities, radio alarm clocks, hair dryers and complimentary Wi-Fi access. Our organic cooked breakfast is not to be missed! Situated in a quiet location in the heart of the village and adjacent to the village green. Cowley House offers an ideal location for your stay in Broadway. 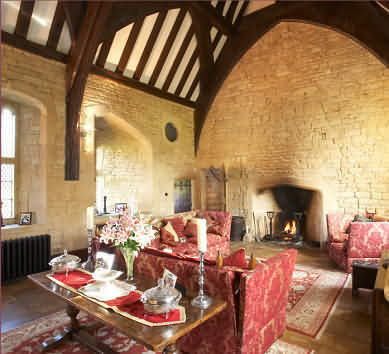 Cowley House is a beautiful mid 18th century Cotswold stone property, originally a farm house. and granary. It has recently been refurbished by the new owners, Joan and Peter Reading, who aim to provide guests with a warm and friendly welcome and the best in hospitality and service. 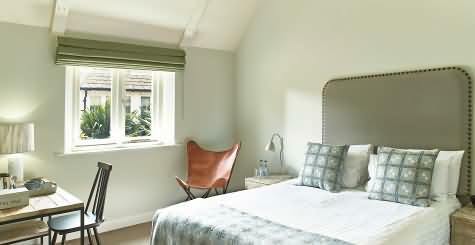 The house and gardens provide an ideal opportunity to relax and enjoy the magnificent Cotswold scenery. The hall has a magnificent flag stone floor and there is a wealth of elm beams in various parts of the house. One of the bedrooms has a romantic Elizabethan style four poster bed, with lovely views and tasteful decor. There are 5 double/twin bedrooms, 4 of which have en-suite facilities, and one which has a private bathroom. Each bedroom is furnished to a high standard. A hospitality tray, personal toiletries, hair dryer, TV, radio, alarm, fluffy bathrobes and magazines are available in each room. A delicious breakfast made with fresh, local ingredients is served in the elegantly refurbished breakfast room. We will happily accommodate any special dietary requirements on request. To the rear of the house there is a patio where guests can relax in tranquillity and look at the views over the hills or take a stroll around the lawns, fish pond and orchard. The centerpiece of this idyllic Cotswolds village of Broadway, Russell's is one of the chicest places to eat and stay in the UK. This award-winning Cotswolds hotel and restaurant, the former showroom of Sir Gordon Russell's furniture, is the perfect place to relax and enjoy the glorious Cotswold countryside. Russell’s opened in 2004, following a painstaking restoration, which transformed this historic building into an elegant and contemporary ‘restaurant with rooms’. A modern, airy restaurant with terrace and private dining room are located on the ground floor, with seven individually designed bedrooms within the same building. Check in now to experience this Cotswolds hotel's delicious modern British food with seven guestrooms and suites all set in laid-back, stylish surroundings. Above the restaurant are seven individually designed bedrooms – a suite, doubles and twin rooms – all with en-suite bathrooms, luxury bedlinen and air conditioning. Flat screen televisions, broadband internet access and original architectural features all combine to create a supremely comfortable experience. A full English breakfast is included. Use the reservation form on our website to make an on-line reservation or to see specific rates for each day. All rates are quoted per room, per night and include accommodation, full English breakfast and VAT at 20%. Complimentary broadband access is available in all bedrooms. Cotswold Life Best New Chef of the Year, Damian Clisby, serves modern British food in the award-winning restaurant, with local Vale of Evesham and Cotswold produce featuring throughout the daily-changing menus. The modern, airy dining room is open for breakfast, lunch and dinner, with friendly staff and laid-back service combining to create a relaxed and warm setting, day and night. The Fish is a new kind of country hotel. We’re affordable but not budget, stylish but not pretentious, and outdoorsy but just as happy to stay in and put our feet up by the fire. With 400 acres of spectacular private estate countryside on our doorstep, a host of activities to try (from shooting to Segway safaris), and all the glories of the Cotswolds within easy reach, The Fish is your back-to-nature bolt-hole with a little touch of luxury. Room prices start from only £125 per night including a hearty full English breakfast. Apple Tree Bed and Breakfast offers that ideal of location and comfort. The Guest House is located only 320 yards from the village green in Broadway, so within easy walking distance of the pretty village’s museums, shops, cafes and restaurants. 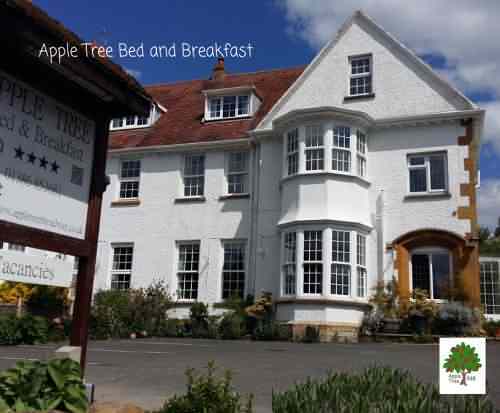 Apple Tree Bed and Breakfast has 8 bedrooms, 6 doubles, king-size or twins with en suite, a family room en suite and a single room with private facilities.All rooms have tea/coffee making facilities, hairdryer, blackout curtains, heated towel rail, reading material and room folder. Bath sheets are provided as standard instead of the smaller bath towels. The light and airy breakfast room gives a wonderful start to the day with a varied menu choice starting with cereals, fresh fruit and yoghurt, followed by a traditional cooked British breakfast, with a vegetarian option available. All items are cooked to order with fresh local ingredients wherever possible. There is a guest lounge for relaxing in the evening, or maybe stroll in the garden as the sun goes down. Apple Tree Bed and Breakfast has a private car park and offers free WiFi. King size en suite from £99 Twin en suite from £92, Family room en suite from £125. Prices may vary at certain times of the year and on festival occasions. 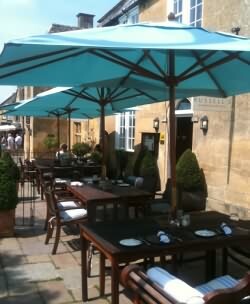 Located in Broadway (often referred to as The Jewel of the Cotswolds). 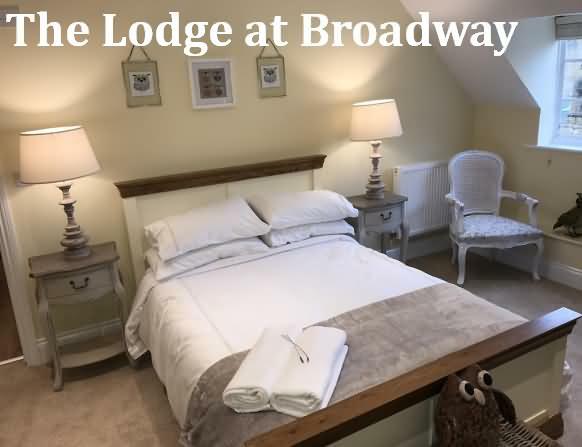 The Lodge at Broadway is 1.4 miles from Broadway Tower and close to many beautiful Cotswold villages. A walkers paradise with many different walks across beautiful countryside. Birmingham Airport is 29 miles away. This property also has one of the top-rated locations in Broadway!